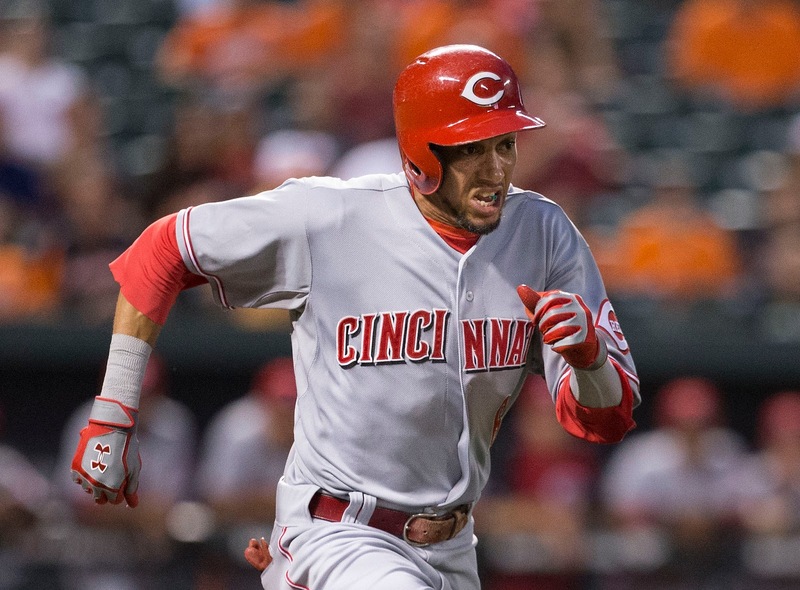 On Baseball & The Reds: Can Billy Hamilton's Legs Make Up for his Bat? Billy Hamilton is having one of the strangest seasons I've ever seen. He has been absolutely terrible at the plate. Really, really bad. Thus far, heading out of the All-Star break, he is hitting .220/.269/.287 with a 52 wRC+. Compared to his 2014 season, when he was merely not good, he is making more contact (19% K rate in 2014, 15% in 2015). However, this contact has been more often soft contact (22% Soft, 21% Hard in 2014, versus 23% Soft, 17% Hard contact in 2015) and he has been hitting slightly fewer ground balls (41.5% in 2014, 40% in 2015). There have been times when I have been more confident in the pitcher's offense than in his, which doesn't happen very often with starting position players. Remarkably, there are currently four qualified batters who have a lower wRC+ than Hamilton this year. Ramirez and Infante, at least, have a history of being at least decent, if not plus, hitters for their positions. Zunino is a catcher with a good defensive reputation. Owings is a sophomore and former good prospect who has fallen on hard times. If any of those guys don't pick up their offense in the second half, however, there's a good chance that they'll lose their starting position. As a result, they won't achieve "qualified batters" status by the end of the season. Therefore, while Billy has been unquestionably bad at the plate, it hasn't quite risen to historical status. The interesting thing to me about these two lists, beyond the magnitude of these hitters' offensive struggles, is that only two of them show up as having positive WAR: Alicedes Escobar and Billy Hamilton. In both cases, the players' WAR totals are buoyed by strong baserunning numbers and strong fielding numbers. There are those who will scoff at fielding data, but I can swallow that an elite defensive player like Escobar could still be worth 1 win above replacement. That's still well below average, and not good. Hamilton, though, currently has 1.6 WAR. That puts him on pace for almost exactly 3 WAR, which would put him as a slightly above-average baseball player. This is despite owning (if it doesn't improve) a batting line that would rank him 6th-worst since 2005. Is that really possible, or is WAR broken when it comes to Hamilton? Let's go component by component. Perhaps more than any other ballplayer, Billy Hamilton's value comes on the basepaths. While last year he was caught regularly, this year he has become far better at determining the best time to go. Heading into last night's game, he had stolen 44 bases and been caught only 6 times, good for an 88% success rate. That's Barry Larkin-level success rates, except that Larkin only topped 44 bases in one season. Hamilton is on pace for 83 thefts. And it's not just his basestealing. Hamilton sails from first the third with ease, and scores from first on anything even remotely resembling an extra base (assuming he hasn't already stolen second). He's been brilliant. The two best baserunning totals since 2005 are Mike Trout in 2012 and Willy Taveras in 2008 (+14 runs each). Hamilton is already 17th on that list at +10.6 runs, with 76 more games to play. That puts him in really good position to be at the top of this list by the season's end. He might even do that by the end of August. Given everything we know about his actual baserunning abilities, I believe these numbers. He's really special out there. He might not reach +20 runs by the season's end (which he's currently on pace to do), but would anyone really be surprised if he posted the best baserunning season of the past decade at +15 runs or so? Thanks in large part to MLB's condensed games, I've been able to watch at least the meaningful plays of almost every Reds game this season. The thing that has stuck out to me, even more so than Hamilton's baserunning, is his defense. I can't count how many times I've seen a ball hit hard into the gap, cursed in anticipation of a double, only to see Billy somehow close on the ball and catch it running. And then there are all those times when he's made those brilliant diving plays in shallow left-center. He's wicked fast, and to my eye it seems like he takes good routes. He's been amazing to watch. Hamilton currently has +11 UZR, which is the fielding metric that FanGraphs uses in WAR. That ranks him 37th among center fielders over the past decade+, and 2nd this season behind Kevin Kiermaier. He is one of only 6 center fielders to have made a play that Inside Edge classified as a "Remote Chance" play, ranks 3rd among CF's among plays ranked as "Unlikely," and 9th among CF's on balls judged as having an "About Even" chance to catch them. Last year, Hamilton was a +22 UZR center fielder, which is what he's pacing right now. The best center field seasons of the past decade have been in the 20-30 range, topped by Franklin Gutierrez's 2009 season at +34 runs. I think most of those are probably overestimates high due to the volatility of fielding stats, but they were all very good fielding players (a young Andruw Jones, Coco Crisp, Carlos Gomez, Michael Bourn, Willy Taveras, etc). Therefore, I think evaluating Hamilton as a +15-20 run fielder in center field is pretty fair. Offense: Hamilton is on pace for -32 batting runs above average. Let's assume, for now, that he won't improve and go with that. Fielding: I'm going to be slightly conservative and put him as a +15 fielder. Position: I'll give him the standard +2.5 runs/season bump for CF's, prorated down to +2.1 runs for 86% playing time (he misses games here and there with small injuries due to his playing style). Replacement: I'll peg Replacement Level as -2.25 wins below average, which is about -20 runs vs. average on the season, prorated down to -17 runs due to playing time (using 9 runs per win). -32 (offense) + 15 (BsR) + 15 (fielding) + 2 (pos) + 17 (field) = +17 runs above average, or 1.9 WAR. In other words, Hamilton rates out as almost exactly a league average player. I'm not arguing he's a plus player, and he's definitely not an all-star. Just that he's a unique, extreme, league-average ballplayer. You can even argue that I'm being conservative. Maybe he's a +20 run fielder. And his rest of season projections have him about equal to his 2014 offensive performance than his miserable 2015 performance (ZiPS has him at .251/.301/.346 the rest of the way). But league average feels about right to me. I really don't think Hamilton is killing the Reds this year, especially not hitting 9th as Price is smartly deploying him. I don't know how long this will last. I worry that Hamilton's all-out play in the field and on the bases will slow him down over the coming couple of years. And if he slows, I don't think his game is amenable to almost any kind of aging. But for now, I think he's an acceptable starting outfielder. And who knows? Maybe he'll still learn to hit a little bit. After all, even just taking a few more pitches, given the generally poor results when he actually swings, could really help his value.